Sustained, clear phonation, standard light. Note vibratory blur of the vocal cord margins. 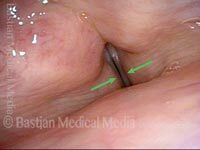 The false vocal cords (lines) are in normal relation to the true vocal cords. Involuntary adductory spasm. Note that the false vocal cords suddenly over-close (arrows) as a result of the adductory spasm, and voice momentarily stops (along with vibratory blur). Continuous phonation, standard light. Note the position of the false cords in relation to each other, and also the distance between the anterior face of the arytenoids and the petiole of the epiglottis. A moment later, an adductory spasm occurs. The spasm may momentarily stop the voice (phonatory arrest). Note the inward squeezing of the entire supraglottis (false cords, arytenoids, and petiole).